Price includes: A color chart and key and a large, easy-to-read black and white chart and key; floss colors for DMC; and a color photo of the finished pieces. Bunny Babies uses soft pastel shades, perfect for decorating a child’s room. 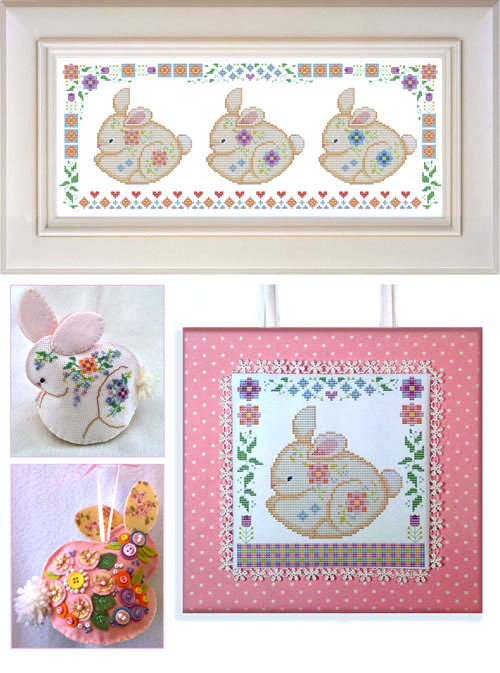 Stitch the large piece to frame, or follow the complete directions included to stitch the smaller design and make a beautiful bunny wall decoration, mounted on a fabric backer. Complete, illustrated directions and patterns are also included for making the two-sided bunny ornament (stitched on aida fabric for one side, felt decorated with beads, buttons, and simple embroidery for the other side). Fun to make, the ornament design includes an optional color chart for cross-stitching both sides, plus tips for making a mobile. The projects are fine for the stitcher with some experience. Frame, fabrics, and embellishments are not included.